In our last installment of Galactic Destinations, we introduced you to the Wreckage, and the shipyards of København. 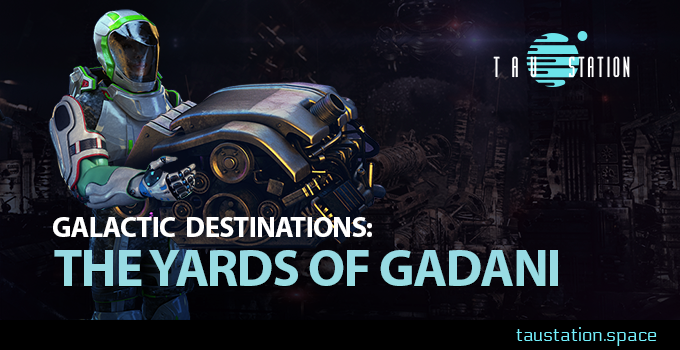 Today, we will give you a glimpse at a station light years away: The Yards of Gadani. Whereas “new” vessels are born on København, ships whose services are no longer needed come to Gadani for their final days. The Yards of Gadani is known for two things: its ship breaking yards, and its reduced gravity. During the Catastrophe, a freighter slated for decommissioning exploded with enough force to slow the station’s rotation, causing untold death and destruction as buildings shifted, collided, and collapsed around the hapless citizens. In the years since, its residents have gradually adapted to life with less gravity, and it has become home to many Belters; those long-limbed individuals who have adapted over the centuries to lower gravity environments. After the Catastrophe, Belters from all over the two star systems, Sol and Alpha Centauri, rushed to this station, enchanted with the idea of having a home that wasn’t a ship, where they could finally stretch their legs. The Yards of Gadani also attracts a regular stream of visitors of all genotypes; some looking for parts with which to repair their starships, while others come hoping to purchase a new (to them) vessel from the shipyards. Those seeking parts find themselves wandering the Bazaar; a marketplace of colorful stands and merchant tents, overflowing with salvaged goods harvested from the ship breaking yards. And those looking for a new ship have a motley crew from which to choose. There are no sleek, shiny corvettes here. Instead, they find a selection of Frankenships, cobbled together from recycled and found parts which more often than not don’t match each other in any way. At times, however, the sundry pieces torn from the metal and plastic carcasses on the ship breaking yards create a more powerful, faster, whole. Gadani is a massive station, built to be able to swallow up broken and disabled ships and spit out their bones. Workers toil in dangerous conditions on the yards, both within and on the outside of the station’s asteroid. They swarm like ants over enormous retired ships, stripping them down and turning them into scrap. The decreased gravity within the asteroid makes the hard work both easier and more dangerous. The lower gravity makes it possible for workers to move and handle massive objects that would normally require heavy machinery or twice the effort. On the yards, the hulls of starships rise up many stories, their exposed metal girders like fleshless skeletons. Outside of the station, ships that are too large to bring into the asteroid float, dead in space, waiting their turn to be tethered down to the outer shell of the asteroid, where they will come to their final rest, their insides slowly being carved away by scavengers searching for scrap metal and anything that can be reused. The residents of the Yards of Gadani have adapted to and are flourishing in the buoyant environments both inside and outside of the station. Ships from all over the star systems, from those only large enough to carry a single pilot, to the massive leviathans that once provided luxury star-cruises, pass their final days here in the ship breaking yards. However, nothing goes to waste in a post-Catastrophe society, and every piece, part, and salvaged good goes on to find a new purpose and to live another life.